Sometimes you have a shirt that, for whatever reason (collar and cuff frays, etc. ), cannot be passed along to Goodwill, but still has some life in the material. 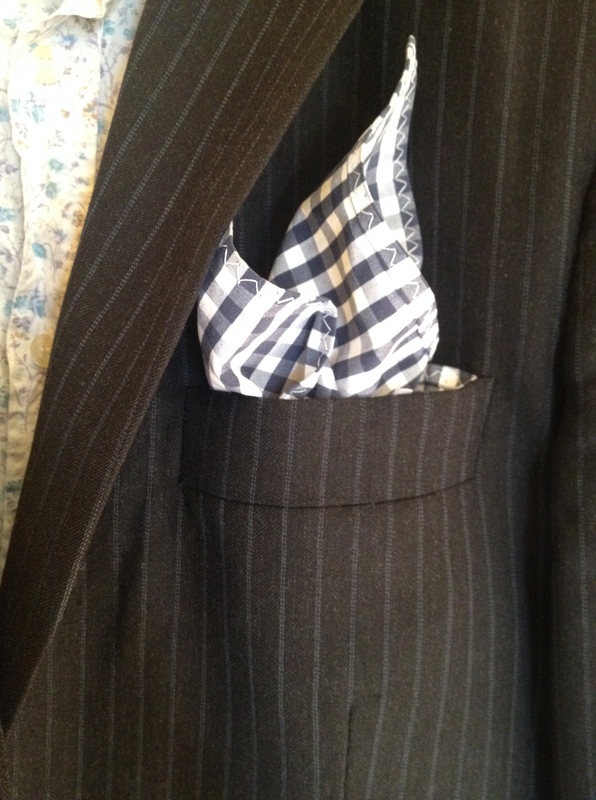 If your husband (brother, friend, neighbour) is a dandy like mine, they’ll appreciate it when you transform that garbage-bound shirt into a dashing pocket square. 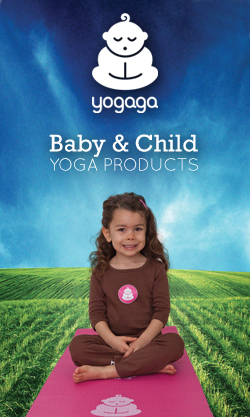 This is a very simple project with a pleasing outcome. It doesn’t require much time – in fact you’ll probably spend the longest amount of time pinning (unless you’re a keener and decide to hand-stitch the edges). Just cut an approximate 12″ x 12″ square from the back of the shirt. 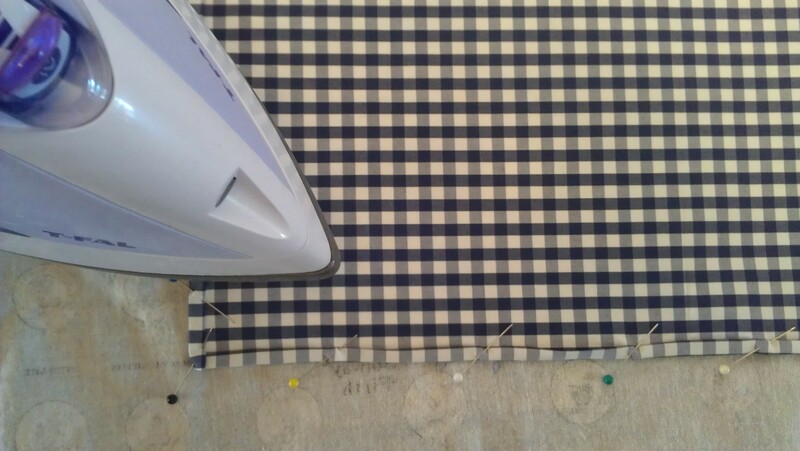 If you’re lucky enough to be using a gingham shirt (which I was), you can fold each side over one square depth, then another and pin. 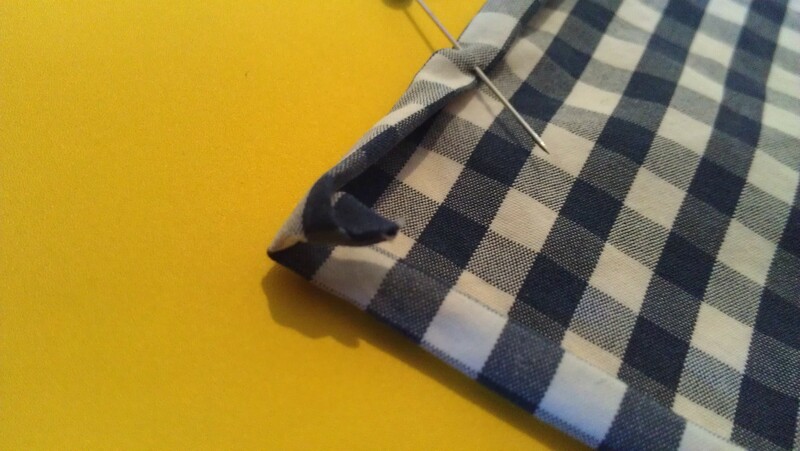 If you’re not using a gingham shirt, fold 1/4″ and then fold another 1/4″ and pin. For the corners, do your folds, and then tuck one corner under the other and the end of the top piece under itself so that it can’t be seen. Make sure your corners aren’t sticking out or you won’t have a perfect square! Iron your folds all the way around the square, or they have a tendency to become untucked and that will drive you to tears if you sew and end up with an untucked fold. Restart! If you’re extremely ambitious, this is the time to use those delicate, little loop stitches and hand sew all the way around, making sure you sew both layers of the fold, to hem your pocket square. Or, if you’re lazy like me, just get out the sewing machine and zip around the outside, hemming it in minutes. I prefer a zigzag stitch, as it guarantees that all the material is sewn and it looks kind of funky. Pass the new pocket square over to your lucky recipient and let them fold it up, put it in their pocket, and look all fancy. Or rock some Annie Hallish menswear fashion and use it yourself!